Red alder (Alnus rubra), also called Oregon alder, western alder, and Pacific coast alder, is the most common hardwood in the Pacific Northwest. It is a relatively short-lived, intolerant pioneer with rapid juvenile growth. The species is favored by disturbance and often increases after logging and burning. Because the commercial value of alder has traditionally been lower than that of its associated conifers, most forest managers have tried to eliminate the species from conifer stands. On the other hand, red alder is the only commercial tree species west of the Rocky Mountains with the capability to fix atmospheric nitrogen, and the species is now being considered for deliberate use in some management systems (19). Red alder is most often observed as a lowland species along the northern Pacific coast. Its range extends from southern California (lat. 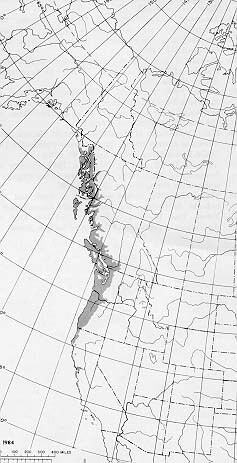 34° N.) to southeastern Alaska (60° N.). Red alder is generally found within 200 km (125 mi) of the ocean and at elevations below 750 m (2,400 ft). It seldom grows east of the Cascade Range in Oregon and Washington or the Sierra Nevada in California, although several isolated populations exist in northern Idaho (36). -The native range of red alder. Red alder grows in climates varying from humid to superhumid. Annual precipitation ranges from 400 to 5600 mm (16 to 220 in); most of the precipitation is rain in winter. Summers are generally cool and dry. Temperature extremes range from -30° C (-22° F) in Alaska and Idaho to 46° C (115° F) in California. Low winter temperatures and lack of precipitation during the growing season appear to be the main limits to the range of red alder. For good development of trees, either annual precipitation should exceed 630 mm (25 in) or tree roots should have access to ground water. Red alder is found on a wide range of soils, from well-drained gravels or sands to poorly drained clays or organic soils. It grows primarily on soils of the orders Inceptisols and Entisols but is also found on some Alfisols, Ultisols, and Histosols. Best stands are found on deep, well-drained loams or sandy loams of alluvial origin; however, some excellent stands are also found on residual or colluvial soils derived from volcanic materials. Soil moisture during the growing season appears to influence where the species grows. Alder can tolerate poor drainage conditions and some flooding during the growing season; consequently, it prevails on soils where drainage is restricted-along stream bottoms or in swamps or marshes. It is not commonly found on droughty soils, however; and in areas of low precipitation, it seldom grows on steep south or southwest-facing slopes. In Idaho and California, stands are usually limited to borders of streams or lakes. Red alder develops best on elevations below 450 in (1,480 ft) in northern Oregon, Washington, and British Columbia. In Alaska, red alder generally occurs close to sea level. Farther south, scattered trees are found as high as 1100 in (3,610 ft), but most stands are at elevations below 750 in (2,460 ft). Red alder grows in both pure and mixed stands. Pure stands are typically confined to stream bottoms and lower slopes. Red alder is, however, much more widely distributed as a component of mixed stands. It is a major component of the forest cover type Red Alder (Society of American Foresters Type 221) and occurs as a minor component in most of the other North Pacific cover types (11). Common tree associates are Douglas-fir (Pseudotsuga menziesii), western hemlock (Tsuga heterophylla), western redcedar (ThuJa plicata), grand fir (Abies grandis), Sitka spruce (Picea sitchensis), black cottonwood (Populus trichocarpa), bigleaf maple (Acer macrophyllum), and willow (Salix spp.). Occasional tree associates include cascara buckthorn (Rhamnus purshiana), Pacific dogwood (Cornus nuttallii), and Oregon ash (Fraxinus latifolia). Western paper birch (Betula papyrifera var. commutata) is an occasional associate in the northern portion of the range of alder, and redwood (Sequoia semperuirens) in the southern portion. Common shrub associates include vine maple (Acer circinatum), red and blue elder (Sambucus callicarpa, S. cerulea), Indian plum (Osmaronia cerasiformis), salmonberry (Rubus spectabilis), western thimbleberry (R. parviflorus), dlevilsclub (Oplopanax horridum), Oregongrape (Berberis nervosa), and salal (Gaultheria shallon). Herbaceous associates include stinging nettle (Urtica dioica), skunkcabbage (Lysichitum americanum), blackberries (Rubus laciniatus, R. leucodermis), California dewberry (R. ursinus), swordfern (Polystichum munitum), lady fern (Athyrium filix-femina), Pacific water parsley (Oenanthe sarmentosa), youthon-age (Tolmiea menziesii), Oregon oxalis (Oxalis oregana), and western springbeauty (Montia sibirica). Flowering and Fruiting- Red alder reaches sexual maturity at age 3 to 4 years for individual trees and age 6 to 8 for most dominant trees in a stand (5). It is generally monoecious, with separate male and female catkins developing on the previous year's twigs (22). Staminate catkins occur in pendulous clumps. In late winter they elongate, changing from green to reddish brown and from 2 to 3 cm (1 in) long to about 7 or 8 cm (3 in). Pistillate catkins also occur in clumps but are borne upright. They are 5 to 8 min (0.2 to 0.3 in) long and reddish green when receptive. Flowering occurs in late winter or early spring; peak shedding of pollen generally precedes peak receptivity by only a few days. Most alder seed is probably the result of outcrossing, but some selfpollination does occur (5). Seed Production and Dissemination- Red alder is a prolific and consistent producer of seed. Moderate seed crops are produced almost annually and bumper crops occur every 3 to 5 years. Complete failure of a seed crop is rare, but after a severe freeze in November 1955, almost no seed was produced in 1956 (43). The seeds are small, winged nuts borne in pairs on the bracts of woody, conelike strobili (33). The strobili are 11 to 32 mm (0.4 to 1.3 in) long, and 8 to 15 min (0.3 to 0.6 in) wide. Seed dispersal begins in late September in the middle of the species'range, somewhat earlier in Alaska, and several weeks later in California. Most of the seeds are shed during late fall and winter. For minimum loss of seeds, cone collection should begin in September in Alaska and continue until December in California. Red alder seeds are very light, numbering 800 to 3,000/g (22,900 to 85,700/oz), and wind dissemination is effective. The seed can be carried long distances by wind, and abundant seed for natural regeneration is usually present throughout the range of red alder. Seedling Development- Red alder germinates and grows well on moist mineral soil with full sunlight. Germination is epigeal. Seedlings can become established from seeds that fall on a highly organic surface, such as forest litter. Because the seeds are so small, however, their food reserves are minimal and the tender radicle must encounter a moist, nutritious substrate almost immediately after germination if the seed is to become an established plant. Seedlings can tolerate partial shade for several years, but after that full sun is required for normal development. Red alder can be regenerated by any method that provides full sunlight and exposed mineral soil. The species is an aggressive pioneer on avalanche paths, road cuts, log landings, skid trails, or other areas where mineral soil has been freshly exposed to seed fall. Clearcutting and large-group selection are feasible regeneration systems. During harvesting or in a subsequent site preparation treatment, the site must be disturbed sufficiently to expose mineral soil. Fire can probably substitute for mechanical disturbance on most sites. To exclude red alder from the next rotation stand, some forest managers try to reduce the supply of alder seed by cutting possible alder seed trees in the vicinity before or at the time of final harvest, and also to avoid creating favorable seedbed conditions by disturbing the site as little as possible during logging and, if feasible, by not burning the logging slash. Artificial regeneration can be accomplished with either bare-root or containerized seedlings. Dried, stored seed need not be stratified (2,29). Nursery production of seedlings is fairly trouble free if standard techniques are used; sowing should generally be done fairly late (in June), however, to prevent the development of seedlings too large to be easily handled by planting crews. If the soil is sterilized, it may be necessary to reinoculate it to speed formation of mycorrhizae and root nodules. Guidelines for producing containerized seedlings are available (2), covering seed treatment, inoculation methods, and growth media. Survival and growth of planted seedlings are usually excellent. Height growth of red alder seedlings is exceptionally rapid. On favorable sites, seedlings can grow 1 m (3.3 ft) or more the first year and on all but the poorest sites, seedlings surpass breast height (1.37 m; 4.5 ft) the second year (16). Maximum annual height growth of more than 3 m (9.8 ft) a year can be achieved by 2- to 5-year-old seedlings (16). Seasonal growth of red alder is under strong climatic control and consequently quite variable. The timing of radial growth is similar for red alder and its common associate Douglas-fir; in the Puget Sound area of Washington State, growth Begins about midApril and continues until mid-September (32). Height growth begins slightly later in the season than radial growth. Red alder has indeterminate height growth; thus, height growth continues through the growing season until soil moisture, temperature, or light conditions become unfavorable. Vegetative Reproduction- Red alder sprouts vigorously from the stump when young. It can be repeatedly coppiced on short cycles but rootstock mortality increases with each harvest (17). Age, time of year, and cutting height influence the likelihood of obtaining stump sprouts and the vigor of the sprouts (15). Stumps will sprout best when trees are cut in the winter and when stump height exceeds 4 in (10 cm). Older trees rarely sprout and coppice regeneration cannot be expected after polesize or saw-log-size material is harvested (15). Greenwood cuttings from young trees can be readily rooted. More than 50 percent of cuttings from 1to 3-year-old plants took root within 6 weeks after treatment with 4,000 to 8,000 p/m indole-3-butyric acid and 10 percent benomyl (27). The cuttings were set in a well-aerated planting mix and placed in a warm environment (22° to 25° C; 72° to 77° F) in the daytime and 16° to 22° C (61° to 72° F) at night with high relative humidity and a 16-hour photoperiod. Cuttings of succulent new spring growth from shoots of 3- to 6-year-old trees and epicormic sprouts from 27- to 34-year-old trees have also been rooted successfully (30). Best results were obtained with a 10-second dip in 2,000 or 4,000 p/m indole-3-butyric acid. The extent of rooting and root vigor on the cuttings varied greatly among ortets and treatments. Red alder can also be propagated by mound layering (41). For this technique the seedlings are first coppiced. When the sprouts are a few months old, the stump and the base of the sprouts are covered with soil. The sprouts soon form roots; they can be severed from the stump and planted at the end of the first growing season. Growth and Yield- Red alder has rapid juvenile growth; of its associates, only black cottonwood grows as much or more during the juvenile phase. On good sites, trees may be 9 in (30 ft) at age 5, 16 in (52 ft) at age 10, and 24 in (79 ft) at age 20. One tree was 9.8 in (32.1 ft) tall and 16.3 cm (6.4 in) in d.b.h. 5 years from seed (36). Mean annual production in 7to 12-year-old thickets has been estimated (oven-dry) at 15.4 t/ha (6.8 tons/acre) (5). Growth slows after the juvenile stage, the decrease beginning much sooner on poor sites. Site index as determined at base age 20 years ranges from 10 to 25 in (33 to 82 ft) (16); at base age 50, it ranges from 18 to 37 in (60 to 120 ft) (44). Associated conifers have much slower juvenile growth, but they sustain height growth years longer than alder. On an average site, both Douglas-fir and red alder can attain the same height at about age 45 (36). Beyond that age, Douglas-fir surpasses red alder in height. Red alder is a relatively short-lived species, maturing at about 60 to 70 years; maximum age is usually about 100 years (45). On favorable sites, trees can be 30 to 40 m (100 to 130 ft) tall and 55 to 75 cm (22 to 30 in) in diameter. A record-size tree measured 198 cm (78 in) in d.b.h., but trees over 90 cm (35 in) in diameter are rare. Maximum cubic volume is attained at age 50 to 70 (500 m'/ha or 7 ' 150 ft'/acre) (5,44). In pure stands on good sites, it has been estimated that red alder can achieve annual cubic volume growth rates of 21 m'/ha (300 ft'/acre) in pulpwood rotations of 10 to 12 years, and 14 m/ha (200 ft'/acre) in saw-log rotations of 30 to 32 years (5). Most of the existing alder volume is in mixed stands where growth and yield are variable. Rooting Habit- Red alder forms extensive, fibrous root systems. Root growth of seedlings is rapid; 2-year-old nursery-grown seedlings have to be planted using a shovel because of their wide-spreading, large, woody roots. Red alder roots are commonly ectomycorrhizal. Only a few species of fungi, however, are capable of forming ectomycorrhizal associations with alder. Fungal symbionts include an alder-specific fungus (Alpova diplophloeus) and fungi capable of mycorrhizal associations with other hosts (Paxillus inuolutus, Astraeus pteridis, and Scleroderma hypogaeum) (26). Red alder also has root nodules that fix atmospheric nitrogen. The nodules are a symbiotic association between the tree and an actinomycete (Frankia spp.). Nodulation occurs soon after seed germination; root systems of seedlings a few months old commonly have dozens of visible nodules, ranging from the size of a pinhead up to 25 min (1 in) in diameter. Mature trees have nodules on both the large woody roots and the smaller new roots. Nodules found on large trees can be as large as 80 or 90 mm (3.1 or 3.5 in) in diameter. Reaction to Competition- Red alder requires more light than any of its tree associates except black cottonwood and is classed as intolerant of shade. Young seedlings can withstand partial shade for a few years but will grow very little; if not released, the seedlings will die. The only trees that survive are those that maintain dominant or codominant crown positions. Self-thinning or mortality caused by competition is rapid, and mean densities in natural stands decrease from 124,000 seedlings per hectare (50,000/acre) at age 5 (7) to 1,665 seedlings per hectare (675/acre) at age 20 (44). Red alder also selfprunes extremely well. Shaded lower branches rapidly die and fall off; alder holes are typically clear and slightly tapered (fig. 3). Live crown ratios in crowded, pure stands are very low, and narrow, domelike crowns are characteristic. Early control of spacing is necessary to keep live crown ratios high enough to maintain good growth beyond the juvenile phase. Saw-log yields can be maximized on short rotations by combining early spacing control with pulpwood thinnings (5). Thinnings in previously unthinned stands are most effective in stimulating growth of residual trees if done before height growth slows-about age 15 to 20 (5,28,39). Thinning in older stands can salvage mortality and help maintain the vigor of residual trees but does not usually accelerate diameter growth (25,40). Epicormic branching has been reported after thinning, especially when thinning has been late or drastic (1,40). Epicormic sprouting is most commonly observed on the south side of stressed trees. Epicormic branches appearing after early thinning are usually ephemeral and not cause for concern. Red alder can be grown in either pure or mixed stands. Creation or maintenance of mixed stands requires careful attention to the respective heightgrowth patterns and tolerances of the species. Alder must be kept in the upper canopy to survive in mixed stands. Damaging Agents- Red alder is fairly free from most insect and disease problems, especially when young (age 40 or 50) and uninjured (21,45). Phellinus igniarius, a white heart rot, is probably the major cause of cull in older trees. Three canker-causing stem diseases-Didymosphaeria oregonensis, Hymenochaete agglutinans, and Nectria galligena-cause some damage, especially in young stands, but their overall impact is slight. Red alder has a number of foliage and catkin diseases, but none are economically important. Many species of fungi have been identified on alder; but, except for those discussed above, they tend to be secondary invaders on dead or dying tissue. Wood stain and decay proceed rapidly in cut trees, and logs should be processed soon after harvest unless they are stored in fresh water (43). During intermediate cuts, care must be taken to avoid injuring residual trees; once trees are injured, decay organisms can invade rapidly. Insect pests are not usually a major concern, but serious outbreaks of some defoliators can cause growth reductions. The forest tent caterpillar (Malacosoma disstria), western tent caterpillar (M. californicum), alder woolly sawfly (Eriocampa ovata), striped alder sawfly (Hemichroa crocea), the alder flea beetle (Altica ambiens), and a leaf beetle (Pyrrhalta punctipennis) have caused substantial damage; but reports of mortality are rare (5,13,45). A flatheaded wood borer (Agrilus burkei) can kill twigs and branches (5,13). The alder bark beetle (Alniphagus aspericollis) breeds primarily in slash and in young stressed trees; however, healthy trees can be attacked when bark beetle populations are high (5). Ambrosia beetles (Gnathotrichus retusus, 7~-ypodendron lineatum, Xyleborus saxeseni) attack logs and slash left on the ground, causing rapid degrade in quality. Insect holes can also serve as entry sites for fungi. Merchantable material should be removed rapidly, and large accumulations of slash should be avoided. Animals cause only minor damage in alder stands. Young trees are occasionally browsed by black-tailed deer, especially during the late summer and fall (6), but alder is not a preferred species. 'Mountain beaver sometimes girdle small stems and branches; their use of alder foliage for food is minor and sporadic except in late September when use is fairly heavy (38). In years of high populations, meadow mice girdle young stems. Damage by meadow mice has been most commonly observed in grassy or very wet areas. Climatic factors can damage red alder. Mortality and top damage have been documented in natural stands after ice storms or unseasonable frosts (10,45). Fire is rarely a damaging agent because of the scarcity of flammable debris in alder stands; in fact, the species sometimes has been planted as a firebreak to protect adjacent conifers (45). Alder bark is thin but sufficiently fire resistant to prevent damage during light surface fires (43). Windthrow is not common in alder because of the intermingling of roots and branches, the absence of leaves during winter storms when soils can be waterlogged, and the relatively deep-rooting habit of the species on well-drained soils. Uprooted trees are most commonly observed along cutting boundaries or where established root systems have been undercut by flooding or erosion. Red alder wood is diffuse-porous, moderately dense, and uniformly textured. It is used in the production of solid wood products, such as furniture, cabinets, case goods, pallets, and novelties (31); composite products, including plywood and flakeboard (5); and fiberbased products, such as tissues and writing paper. Alder is a common fuelwood and is burned both in home fireplaces and stoves, and in mills that use residues to produce heat for drying and other processes (31). Because of its rapid juvenile growth and ability to coppice, red alder has been evaluated for use in biomass farms for energy conversion (5); some experimental plantings have been made to evaluate yields under intensive management. The ability of red alder to fix atmospheric nitrogen can result in increases in both nitrogen content and its availability in the soil. Nitrogen fixed irr the nodules is added to the soil in four ways: direct excretion from living roots or nodules, decomposition of dead roots or nodules, leaching from foliage, and decomposition of litter rich in nitrogen. Fixation rates vary diurnally and seasonally (37) and with site and stand age (3,36). Maximum annual fixation rates of 320 kg/ha (290 lb/acre) (36, based on accretion) in pure stands and 130 kg/ha (120 lb/acre)(3, based on acetylene reduction assays) in mixed stands have been reported. Red alder also increases the organic matter content in the soil (34,36). Concomitant with increases in soil organic matter, decreases in soil bulk density and pH have been reported (4,34,36). Red alder has been proposed for use alone and in both crop rotation and mixture with other species (8). Because of its ability to add nitrogen and organic matter to a site and its rapid juvenile growth on a variety of sites, the species has been experimentally planted as follows: (a) to serve as a nitrogen source for other species (particularly Douglas-fir and black cottonwood) (5,9); (b) on coal mine spoils, landslides, and other eroded or low fertility areas (20,35); (c) for streambank or roadside protection; (d) in areas of poor drainage; (e) as a firebreak or windbreak (5,34); and M for wildlife areas. An additional experimental use of red alder in a crop rotation system is to plant it in areas containing coniferous root pathogens, such as Phellinus weiri, which can survive for many years in organic materials in the soil (14). The only known control is to replace the disease-susceptible species with a nonsusceptible species for 40 to 50 years. Red alder is a good candidate for such an interim species. Other experimental uses of alder include addition of foliage, twigs, and sawdust to grain or alfalfa for cattle feed and addition of sawdust to nursery soils to increase organic matter. Population differences in height growth, diameter growth, stem form, bark thickness, and resistance to frost or insect attack have been demonstrated in a provenance trial in coastal Oregon involving 10 sources from the range of red alder (5). High growth rates were positively correlated with good form but negatively correlated with resistance to spring frosts. Differences among provenances in bole volume or aboveground biomass were greater than differences in height or diameter alone (24). Specific gravity did not differ significantly among provenances, nor was it correlated with growth rate (17). The fastest growing trees in the provenance trial were from northwestern Washington, but trees from British Columbia, southwestern Washington, and Oregon also grew well. The slowest growing trees were from Alaska and Idaho. Thus, it appears reproductive material of red alder can be moved to mild sites over fairly long distances along the Pacific coast. Differences in form and in characteristics of branch, bark, and wood among eight stands in western Washington have also been assessed (5). Variability among trees in a stand was high; only bark thickness, a branch diameter index, branch angle, and a crown-width index differed significantly among stands. A cut-leaf variety (Alnus rubra var. pinnatisecta) is found in a few isolated areas in British Columbia, Washington, and Oregon. The cut-leaf characteristic is caused by a single recessive gene (42); thus, the cut-leaf variety can be used as a marker in genetic breeding studies (5). Families varied in their height-growth response to water-table depth in a 24-family progeny trial in western Washington (23). Use of genotypes tolerant of waterlogging may enhance growth of red alder on wet sites. Phenotypic variation between trees is high. Studies are underway to assess genotypic variation and the heritability of various traits. An individual tree approach for selection has been recommended for tree improvement programs. Because red alder has extensive populations of even-aged stands and because of its reproductive and growth characteristics, the species has the potential for rapid genetic gains (5). No races of red alder have been described. Races may exist, however, especially in the disjunct populations or in the extremes of the range. One researcher has divided the species into three populations (northern, central, and southern) on the basis of vegetative and reproductive features from herbarium specimens (12). No natural hybrids have been documented, but possible hybrids with Alnus tenuifolia and A. rhombifolia have been described where the ranges of these species overlap in Idaho (36). Red alder has been successfully crossed with A. cordata, A. glutinosa, A. japonica, and A. sinuata (5). Berntsen, C. M. 1961. Pruning and epicormic branching in red alder. Journal of Forestry 59(9):675-676. Berry, A. M., and J. G. Torrey. 1985. Seed germination, seedling inoculation and establishment of Alnus spp. in containers in greenhouse trials. Plant and Soil 87(l):161-173. Binkley, Dan. 1981. Nodule biomass and acetylene reduction rates of red alder and Sitka alder on Vancouver Island, British Columbia. Canadian Journal of Forest Research 11(2):281-286. Bollen, Walter B., Chi-Sin Chen, Kuo C. Lu, and Robert F. Tarrant. 1967. Influence of red alder on fertility of a forest soil. Microbial and chemical effects. Oregon State University, School of Forestry, Forest Research Laboratory, Research Bulletin 12. Corvallis. 61 p.
Briggs, David G., Dean S. DeBell, and William A. Atkinson, comps. 1978. Utilization and management of alder: Proceedings of a Symposium. USDA Forest Service, General Technical Report PNW-70. Pacific Northwest Forest and Range Experiment Station, Portland, OR. 379 p.
Brown, Ellsworth Reade. 1961. The black-tailed deer of western Washington. Washington State Game Department, Biological Bulletin 13. Olympia. 124 p.
DeBell, Dean S. 1972. Potential productivity of dense, young thickets of red alder. Crown Zellerbach, Forest Research Note 2. Camas, WA. 7 p.
DeBell, Dean S. 1979. Future potential for use of symbiotic nitrogen fixation in forest management. In Symbiotic nitrogen fixation in the management of temperate forests. p. 451-466. J. C. Gordon, C. T. Wheeler, and D. A. Perry, eds. Oregon State University, Corvallis. DeBell, Dean S., and M. A. Radwan. 1979. Growth and nitrogen relations of coppiced black cottonwood and red alder in pure and mixed plantings. Botanical Gazette 140 (Supplement): S-97-101. Duffield, John W. 1956. Damage to western Washington forests from November 1955 cold wave. USDA Forest Service, Research Note 129. Pacific Northwest Forest and Range Experiment Station, Portland, OR. 5 p.
Furlow, J. 1974. A systematic study of the American species of Alnus (Betulaceae). Thesis (Ph.D.), Michigan State University, East Lansing. Fumiss, R. L., and V. M. Carolin. 1977. Western forest insects. U.S. Department of Agriculture, Miscellaneous Publication 1339. Washington, DC. 654 p.
Harrington, Constance A. 1984. Factors influencing initial sprouting of red alder. Canadian Journal of Forest Research 14(3):357-361. Harrington, Constance A., and Robert 0. Curtis. 1986. Height growth and site index curves for red alder. USDA Forest Service, Research Paper PNW-358. Pacific Northwest Research Station, Portland, OR. 14 p.
Harrington, Constance A., and Dean S. DeBell. 1980. Variation in specific gravity of red alder (Alnus rubra Bong.). Canadian Journal of Forest Research 10(3):293-299. Harrington, Constance A., and Dean S. DeBell. 1984. Effects of irrigation, pulp mill sludge, and repeated coppicing on growth and yield of black cottonwood and red alder. Canadian Journal of Forest Research 14(6):844-849. Heebner, Charles F., and Mary Jane Bergener. 1983. Red alder: a bibliography with abstracts. USDA Forest Service, General Technical Report PNW-161. Pacific Northwest Forest and Range Experiment Station, Portland, OR. 186 p.
Heilman, P. E. 1979. Use of alders in coal spoil reclamation in the Pacific Northwest. In Symbiotic nitrogen fixation in the management of temperate forests. p. 477. J. C. Gordon, C. T. Wheeler, and D. A. Perry, eds. Oregon State University, Corvallis. Hitchcock, C. Leo, Arthur Cronquist, Marion Ownbey, and J. W. Thompson. 1964. Vascular plants of the Pacific Northwest. Part 2: Salicaceae to Saxifragaceae. University of Washington Press, Seattle. p. 74. Hook, Donal D., Marshall D. Murray, Dean S. DeBell, and Boyd C. Wilson. 1987. Variation in growth of red alder families in relation to shallow water table levels. Forest Science 33(l):224-229. Lester, D. T., and D. S. DeBell. 1989. Geographic variation in red alder. USDA Forest Service, Research Paper PNW-409. Pacific Northwest Research Station, Portland, OR. 8 p.
Lloyd, W. J. 1955. Alder thinning-progress report. U.S. Department of Agriculture, Soil Conservation Service, Technical Notes, Woodland Conservation 3. Portland, OR. 6 p.
Molina, Randy. 1979. Pure culture synthesis and host specificity of red alder mycorrhizae. Canadian Journal of Botany 57(11):1223-1228. Monaco, Philip A., Te May Ching, and Kim K. Ching. 1980. Rooting of Alnus rubra cuttings. Tree Planters' Notes 31(3):22-24. Olson, Robert, David Hintz, and Edwin Kittila. 1967. Thinning young stands of alder. U.S. Department of Agriculture Soil Conservation Service, Technical Notes TN 122 Woodland. Portland, OR. 2 p.
Radwan, M. A., and D. S. DeBell. 1981. Germination of red alder seed. USDA Forest Service, Research Note PNW-370. Pacific Northwest Forest and Range Experiment Station. Portland, OR. 4 p.
Radwan, M. A., T. A. Max, and D. W. Johnson. 1989. Softwood cuttings for propagation of red alder. New Forests 3:21-30. Resch, Helmuth. 1980. Utilization of red alder in the Pacific Northwest. Forest Products Journal 30(4):21-26. Reukema, Donald L. 1965. Seasonal progress of radial growth of Douglas-fir, western redcedar and red alder. USDA Forest Service, Research Paper PNW-26. Pacific Northwest Forest and Range Experiment Station, Portland, OR. 14 p.
Schopmeyer, C. S., tech. coord. 1974. Alnus B. Ehrh. In Seeds of woody plants in the United States. p. 206-211. U.S. Department of Agriculture, Agriculture Handbook 450. Washington, DC. Tarrant, Robert F., and Richard E. Miller. 1963. Accumulation of organic matter and soil nitrogen beneath a plantation of red alder and Douglas-fir. Soil Science Society of America Proceedings 27(2):231-234. Tarrant, Robert F., and James M. Trappe. 1971. The role of Alnus in improving the forest environment. Plant and Soil, (Special Volume):335-348. Trappe, J. M., J. F. Franklin, R. F. Tarrant, and G. M. Hansen, eds. 1968. Biology of alder: Proceedings of a Symposium. Fortieth Northwest Scientific Association Meeting. USDA Forest Service, Pacific Northwest Forest and Range Experiment Station, Portland, OR. 292 p.
Tripp, L. N., D. F. Bezdicek, and P. E. Heilman. 1979. Seasonal and diurnal patterns and rates of nitrogen fixation by young red alder. Forest Science 25(2):371-380. Voth, Elver Howard. 1968. Food habits of the Pacific mountain beaver, Aplodontia rufa pacifica Merriam. Thesis (Ph.D.), Oregon State University, Corvallis. Warrack, George. 1949. Treatment of red alder in the coastal region of British Columbia. British Columbia Forest Service, Research Note 14. Victoria. 7 p.
Warrack, G. C. 1964. Thinning effects in red alder. British Columbia Forest Service, Victoria Research Division, Victoria. 8 p.
Wilson, Boyd C., and Nora W. Jewett. Propagation of red alder by mound layering. Unpublished report. Washington State Department of Natural Resources, Olympia. Wilson, Boyd C., and Reinhard F. Stettler. 1981. Personal communication. University of Washington, Seattle. Worthington, Norman P. 1957. Silvical characteristics of red alder. USDA Forest Service, Silvical Series 1. Pacific Northwest Forest and Range Experiment Station, Portland, OR. 15 p.
Worthington, Norman P., Floyd A. Johnson, George R. Staebler, and William J. Lloyd. 1960. Normal yield tables for red alder. USDA Forest Service, Research Paper 36. Pacific Northwest Forest and Range Experiment Station, Portland, OR. 3 p.
Worthington, Norman P., Robert H. Ruth, and Elmer E. Matson. 1962. Red alder: its management and utilization. U.S. Department of Agriculture, Miscellaneous Publication 881. Washington, DC. 44 p.